Patients visiting the dentist for cleaning and recare often have calcium tartar buildup on their teeth that can range from minimal to extensive. In the past it was thought that this was primarily an issue of a patient not cleaning properly but as dentists we often notice that some people seem to be more prone to this buildup no matter how well they clean. New research indicates that increased calcium buildup may be a medical issue instead of a dental issue. In an effort to balance blood chemistry that may be off balance and too acidic due to diet, it is believed buffering takes place by blood in the bone removing phosphates with calcium attached. It is believed the phosphates stabilize the blood and body ph and the calcium is released and deposited in the body on teeth and in the arteries. 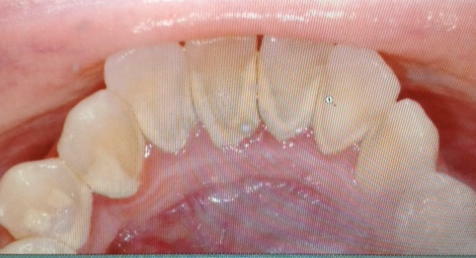 Here below we see excess calcium on the teeth in the form of tartar.